This was my 50th Ellis Paul show! I saw him for the first time at my alma mater, Bowdoin College, back in 2002. I actually had to pass on a few of his shows in Maine over the last year so I could see my 50th show in a venue I really like, and One Longfellow Square fit the bill perfectly. 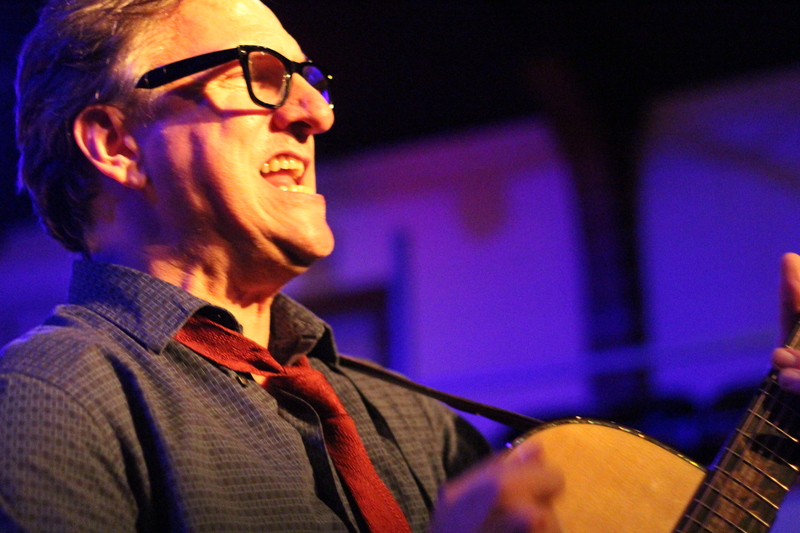 Ellis and his friends have been warming up for their annual Club Passim New Year’s Eve shows at OLS for a solid decade or more, and that festive year-end energy felt like the right time for a milestone 50th show. I’d had a vision that I’d get to sing a song on stage or at least get a shout out from Ellis, and even though neither of those dreams came true, this was the best Ellis has sounded in a couple of years, so my 50th show was still an understated success. I arrived early at OLS because this show is usually sold out and grabbed an extra seat for Colin in the front row. Ellis’ girlfriend, Laurie MacAllister of Red Molly, opened the show with Red Molly’s bassist, Craig Akin, on upright bass. 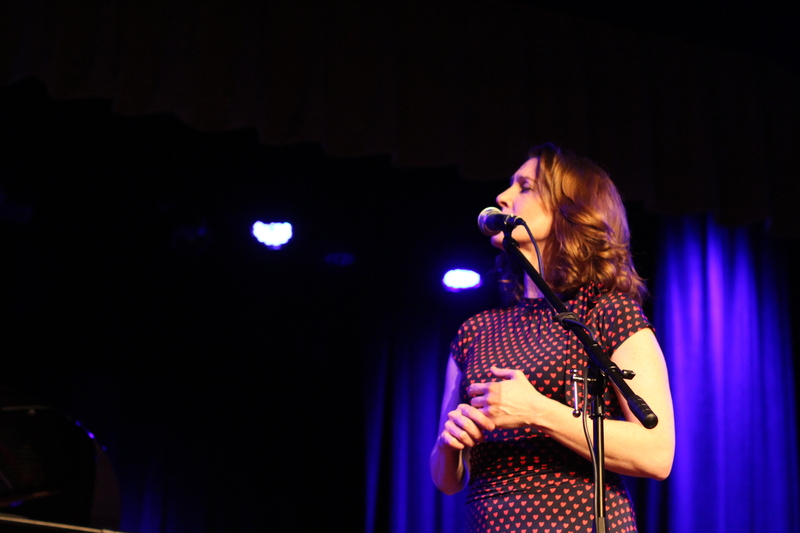 Laurie put out The Lies the Poets Tell earlier in the year–a record of cover songs about love–and she played a handful of songs from that album for us. She told us that she hadn’t been able to write a song in many years, but her friend and collaborator, David Glaser, who we’d seen play at this very show last year, passed away unexpectedly, and “Out of the Darkness”–a song for David–poured out of her. She covered “Vertigo” by Mark Erelli and Antje Duvekot and “Ten Year Night” by Lucy Kaplansky. Laurie has a pretty voice and is humble and a bit shy on stage. I’d love to hear her singing her own songs in the years ahead. 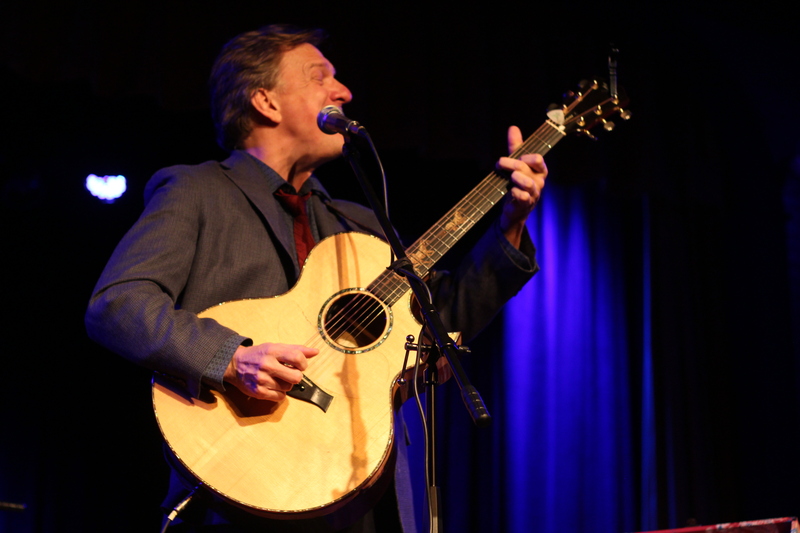 Ellis Paul took the stage with Radoslav Lorkovic, Craig, and Laurie, and they entertained a warm crowd with a variety of Ellis’ songs spanning many years. 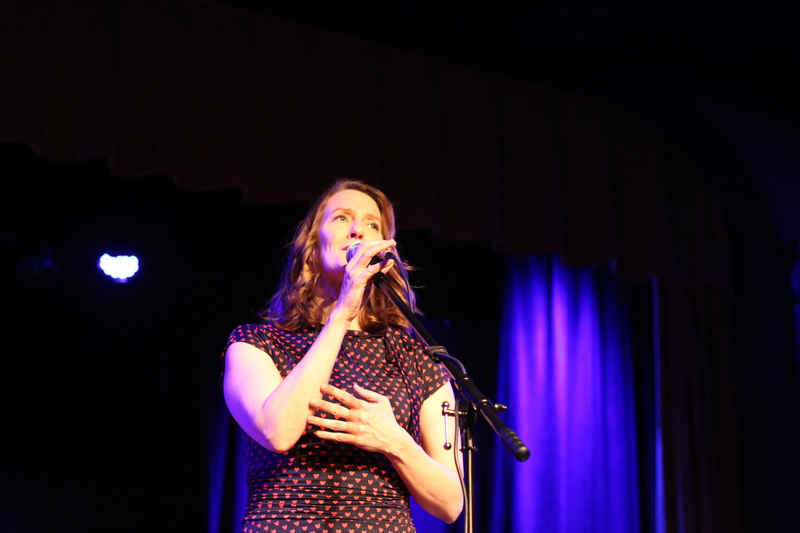 Laurie sang lead vocals on “Home,” which she also covers on The Lies the Poets Tell. Laurie is a great support for Ellis on stage. 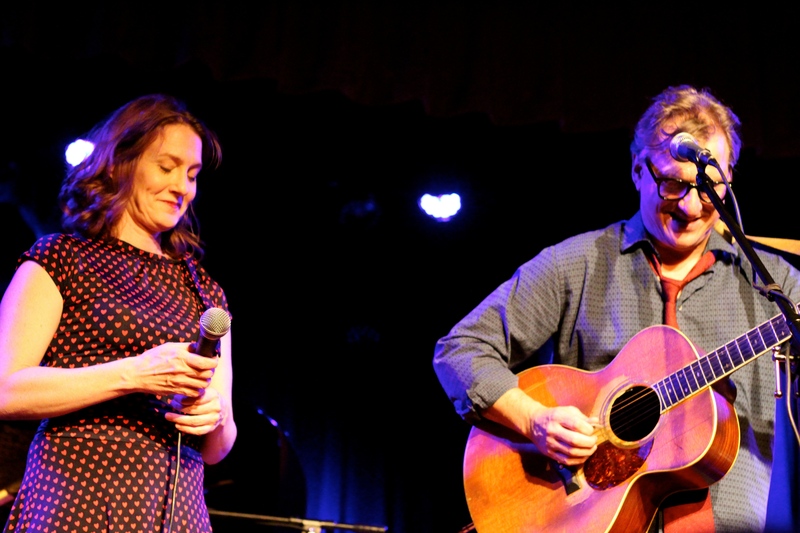 It’s clear that his voice has struggled to hit the higher notes of his older songs given his rigorous touring schedule, and Laurie is able to supplement his vocals nicely, though it does feel like more of a duet act than a solo singer-songwriter one these days. The quartet dazzled with three covers in their annual end-of-the-year cover songs portion of the setlist–David Glaser’s lovely “Concrete River,” Bruce Springsteen’s “Dancing in the Dark,” and “Africa” by Toto. Ellis joked that Don Con nearly quit the band years earlier the first time they tried to cover Toto, but that they’d worked it out. I think Rad was “Kicking Out the Lights” in this one! The band took an intermission after playing ten songs, and I decided to say hi to Ellis in the lobby and let him know it was my 50th show. I really don’t like talking to musicians for the most part because I’m weary about being an annoying fan, but I did want him to know. I said hello and told him it was my 50th show and he very kindly pulled me in for a hug and said a genuine thank you for the ongoing support. I am always happy to hear Ellis play Mark Erelli’s beautiful and timeless “The Only Way.” They dedicated the last song of their set–“The World Ain’t Slowin Down”–to their friend David Glaser and we sang along. We asked for an encore and Ellis and the gang unplugged and sang “Annalee” from within the crowd on the floor. It was the best Ellis show I’d seen in awhile, and a nice one to mark 50 Ellis Paul shows with, too. This was my 49th Ellis Paul show! I hope I get to sing on stage with him at my 50th show. I can sing, Ellis! I started seeing Ellis Paul in 2002, so that’s 15 years of great music I’ve gotten to hear him perform live. 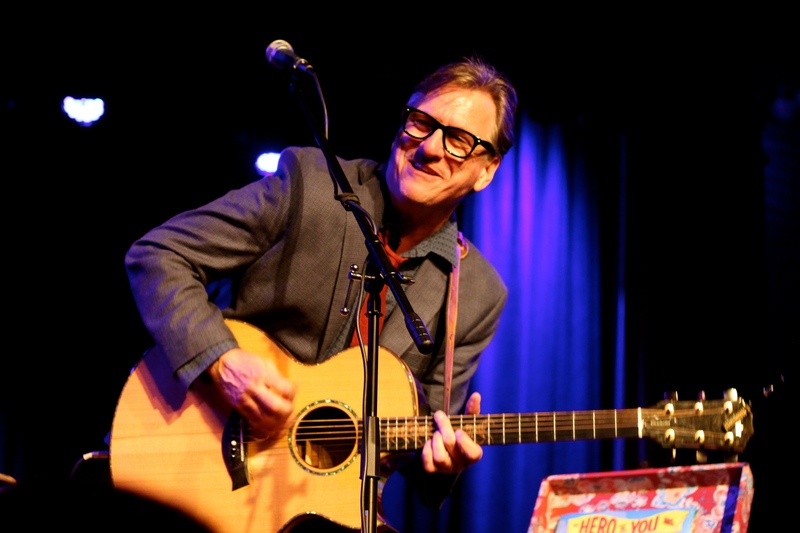 He’s still my favorite singer songwriter, and I love seeing him live at his now annual warm up to New Year’s Eve show at One Longfellow Square. 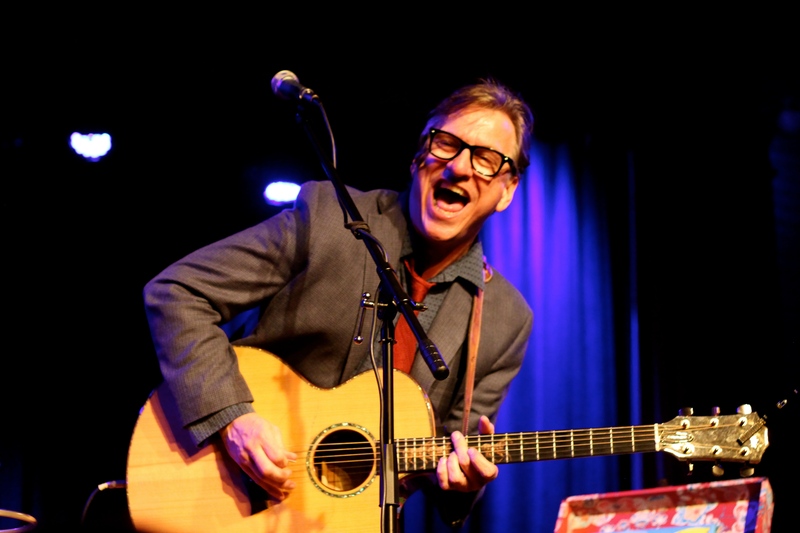 I used to ring in the New Year with Ellis and friends every year at Club Passim in Cambridge, Massachusetts, but Portland is so much closer! I picked up my friend Hedda in the snow and we slowly made it to Portland on a slippery highway. We had a delicious dinner nearby at Mi Sen, but were squeezed for time and had to miss seeing my talented pianist friend, Ben Cosgrove, at Blue. We made it to One Longfellow Square right after 7 to get good seats up front, and there were easily already 25 people in the room. I know where the super fans sit (I am a fan, not a super fan), and decided I needed a couple of rows of buffer, so grabbed seats for Colin, Hedda, and me in the fourth row. We chatted for an hour and then Laurie MacAllister (of Red Molly) took the stage to start the show. Hedda saw her first Ellis Paul show (my 46th) with me last year at Brunswick’s Unitarian Universalist Church, and Laurie sang with him then, too. We thought their chemistry was obvious, and wondered if they were a couple back then. They were, we discovered at this show. Laurie MacAllister has a very pretty voice and was so grateful to perform her first solo show in 14 years in front of such a polite audience. Her new solo record, The Lies the Poets Tell, is out in late January. It’s a cover album of songs from artists you may not know–including Shawn Mullins (one of my all time favorites), Mark Erelli (who Laurie called her favorite songwriter and urged us to see live), Antje Duvekot, oh, and some guy named Ellis Paul. She opened with Shawn Mullins’ “My Stupid Heart.”David Glaser joined her on guitar–she told us she’d heard him play last year during preparations for Ellis’ annual New Year’s Eve shows and asked him to be her guitarist on her new album–and Radoslav Lorkovic, the “Croatian Sensation,” accompanied on piano and accordion. Laurie told us she met Rad for the first time back in 2005 when they played at the same music festival. When she and her Red Molly bandmates told him they were off to New York City for a gig later that evening, he asked if he could come with them and play, too, which they all quickly agreed to. David, Rad, and Laurie were also Ellis’ band that evening. They are obviously friends and it was fun to watch them together. Ellis Paul took the stage to a sold out crowd after intermission. He told us he wrote a song with a friend in mind that was supposed to be more of a joke, but turned into his love song, “I Ain’t No Jesus.” I’d never heard Ellis talk about dating Laurie before, but he talked about her saying “I’ll Never Be this Young Again” in reference to recording a new album, and he stole her line and wrote a song featuring it. Laurie interjected that she came down to the living room the next morning and he played it for her–completely finished overnight. He told us it was one of the first times he’d ever played it live. Ellis told us he’d record an album in 2018, and I think I’m most looking forward to “Scarecrow in a Corn Maze”–a song about a soldier injured in Iraq who comes home from war and struggles. The chorus goes, “scarecrow in a corn maze, just trying to find some way out.” Ellis has always been an excellent storyteller. His songs are relatable because they tell real human stories. This song stuck out to me the most among songs I don’t know very well. We sang along to a song that Ellis wrote about all of the states he’s performed in called “So You Ain’t From these Parts.” The verse about Maine features the crazy names of places here from Damariscotta to the Cobbosseecontee. Every year, Ellis and his friends play a medley of songs during their NYE shows. This year, they paid tribute to music legends lost in the last couple of years–Tom Petty, Glen Campbell, and Glenn Frey. Their cover of “Stop Draggin’ My Heart Around” was incredible. I’ll admit I’d never heard Glen Campbell’s “Wichita Lineman” before. Everyone came off the stage into the audience and sang “Seven Bridges Road” (famously covered by the Eagles) for us. Ellis thanked us for our continued support and for coming out in the bitter cold. He told us his kid just got $3,300 braces, and chuckled when he told us that we’d paid for them. I figure my 49 concert tickets will pay for at least a year of a teenager’s car insurance when his girls start driving. Did we all sing along to “The World Ain’t Slowin’ Down”to close the night? I think we did. I am sleep deprived from New Year’s Eve last night. Thanks for a lovely evening of music that always makes me feel like I’m home, Ellis and friends. I’ll see you soon! Happy 2018! Let’s all hope for goodness and light in the year ahead! This was my 46th Ellis Paul show, and it was fantastic. Obviously, some Ellis Paul shows are better than others, and I can tell the difference, even if I’m biased. There was a point in time a few years ago when Ellis’ voice sounded strained (he plays hundreds of shows a year, so that’s to be expected) and he needed to work with a voice coach and get some vocal rest. I also didn’t love how he gave up telling a lot of his best stories about a year ago (how he found his guitar, Guinness, for example) to banter instead about how we’ve lost our connection to music we can hold in our hands and carried a record player around to all of his shows. The last two of his shows that I saw (January 1 at One Longfellow Square) and this lovely night were full of the best of Ellis—with a powerful voice and great storytelling. Hedda and I have been friends since we both had bad hair in high school (she had a bowl cut. I had a spiral perm). She was able to join me at the beautiful Unitarian Universalist Church in Brunswick for her first-ever Ellis Paul show. My dear colleague Dennis and his beloved wife, Jean, were also able to come for their first-ever Ellis experience. I love introducing people to Ellis Paul. It never gets old. All of them, of course, loved him. He was really on that night! Girls’ night out! Me and Hedda! 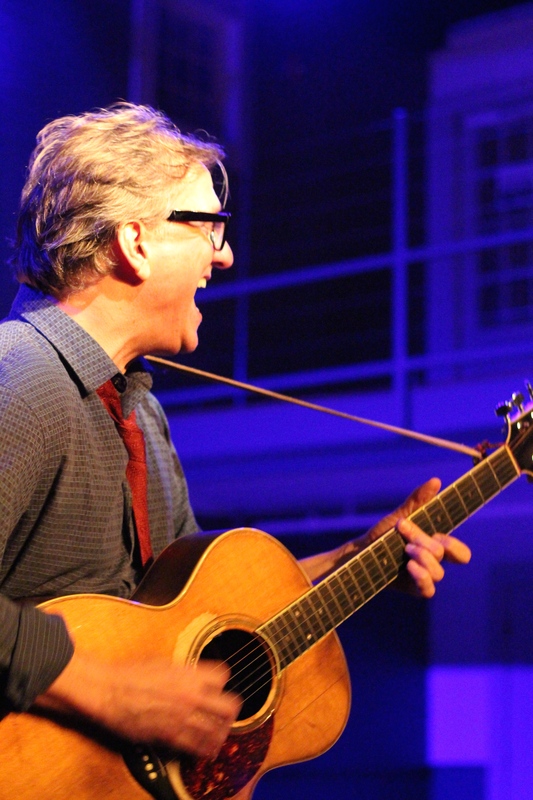 This show was one in a series of Concerts for a Cause at the UU Church. They host concerts to raise money for local charities chosen by church members. This year’s charities are Midcoast Hunger Prevention, Tedford Housing, Independence Association, Spindleworks, Habitat for Humanity, Gathering Place, Boys to Men, Maine Hospice, ILAP (Immigrant Legal Advocacy Project), Natural Resources of Maine, Coastal Humane Society, and Doctors Without Borders. It’s time for a brief concert etiquette lesson. If you’re taking photos at a concert with a camera that makes sound, it’s polite to shoot during a few songs and then put the camera away. The same goes for taking photos with a cell phone, even if it’s silent. No one wants to listen to your camera click or watch a show through your cell phone screen if they’re stuck sitting behind you. It is not polite to take photos throughout every song such that people around you can’t enjoy the tender moments in the song because everyone in a five-plus row radius can only hear the constant click of your camera. I spoke to this particular Ellis superfan during intermission and asked her to kindly put the loud camera away after intermission, and she obliged. I think the folks sitting behind her had to endure watching the rest of the show through the screen of her cell phone while she took photos without sound (a bummer still, even if somewhat an improvement), but the second half of the show was a ton more enjoyable for those of us a bit farther away. Ellis at the piano and the offending constant click of that camera in the foreground. Audience etiquette no no. Ellis obviously impressed the sold out crowd. Folks were toe tapping and laughing and singing along (when invited) all night long. The truly talented Laurie MacAllister from Red Molly sang a few songs with Ellis. She’s performed with him every time I’ve seen him over the last year or so, and is a real treat. 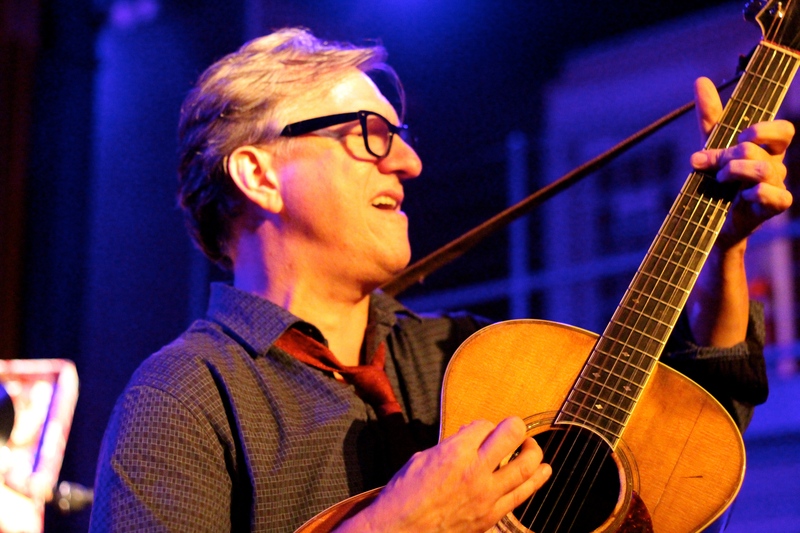 He introduced us to his beautiful new guitar, Sprocket, which he invited us to take a closer look at after the show. I didn’t take notes and just enjoyed the show; so I have nothing resembling a set list for you, but I remember that he wrapped his set with an improved song at the piano about being back in Maine (which was creative and hilarious) and his encore was an unplugged sing along to Joni Mitchell’s “Circle Game” from the middle of the room. “Circle Game” from the center of the room. Do you think you get to sing a song on stage with Ellis at your 50th Ellis show? Starting to plan ahead. Thank you, Ellis, for another wonderful night! When I went to this show—my 45th Ellis Paul show—I knew my two-year-long relationship was essentially over (I respect that this is minor in the scheme of the universe), and I was feeling all the feelings. I also hadn’t really shared this information yet, so I was trying to hold it all together. I’m someone who doesn’t have a lot of interest in major holidays, but I’ve always loved the clean slate that comes with a new year, and I really wanted to make this night—the first of 2016—as happy as I could muster. I am so grateful for dear friends and the comfort of music. If ever there was someone I’d want to see perform while tending a broken heart, it’s Ellis Paul. 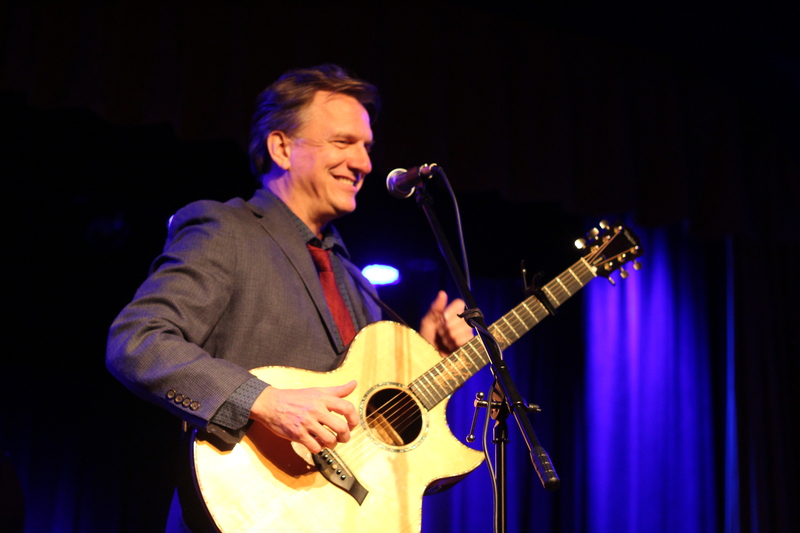 His songs are vignettes—stories from many people’s lives—full of love and loss and change. Seeing an Ellis show, for me, is like being home wherever I am, despite whatever is going on. This was a well-timed night for this very uplifting show. I left feeling much better than I did when I arrived. That’s pretty high praise. I had a lovely dinner at Empire with my friend Megan and her parents. She’d gifted them dinner and their first-ever Ellis Paul show for Christmas, and I got to tag along with them for the night. Colin, my steadfast concert friend, joined us and we filled in the middle of the second and third rows at One Longfellow Square. It was already pretty full when we got there fifteen minutes after the doors opened, so we were lucky to get such good seats at cozy OLS. Austin, Texas’ Betty Soo opened the show. She was personable and seemed glad to be with us. She told us some of the gross band names she’d seen written on the walls downstairs in the green room (I’ll spare you). I particularly liked the song she wrote for her husband (who is her roadie and merch guy, too), “Whisper My Name.” Betty is a celebrated songwriter and was even named Kerrville New Folk Winner at the Kerrville Folk Festival. I was so glad to see Don Conoscenti and Radoslav Lorkovic take the stage with Ellis Paul. From that moment forward, I soaked in the familiar songs, the friendly banter, and the opportunities to sing along (when invited). It was the best I’d heard Ellis sound in a while. Laurie MacAllister from Red Molly joined the gang for about 1/3 of the songs, including a heart wrenching cover of “To Make You Feel My Love” and a cover of Little Big Town’s “Girl Crush,” which Massachusetts-based folk singer-songwriter Lori McKenna co-wrote and won a Best Country Song Grammy Award for. Colin kept track of the night’s set list, which is helpful now that I’m finally emerging from hibernation and writing this four months later. I was grateful to hear some of my favorite “older” Ellis songs like “3,000 Miles” and “Martyr’s Lounge,” peppered with great covers by the whole gang (Don sounded awesome on “What a Fool Believes”), and Ellis reading his book The Night the Lights Went Out on Christmas. This show gave me exactly the escape I needed and helped me feel at least a little glad to see 2016, after all. My dear friend Dot asked if I wanted to join her for her very first Ellis Paul show. Of course I wanted to! I love going with Ellis Paul first-timers to see their reaction to his fantastic storytelling and engaging live show. Dot and I met after school and carpooled to Boothbay Harbor, where we boldly invited ourselves to share a big table with a man and his son at the very crowded The Thistle Inn (who, of course, we found out we had people in common with) and made it over to the Boothbay Opera House when doors opened. I hadn’t been to the Boothbay Opera House in years and it looks fantastic! 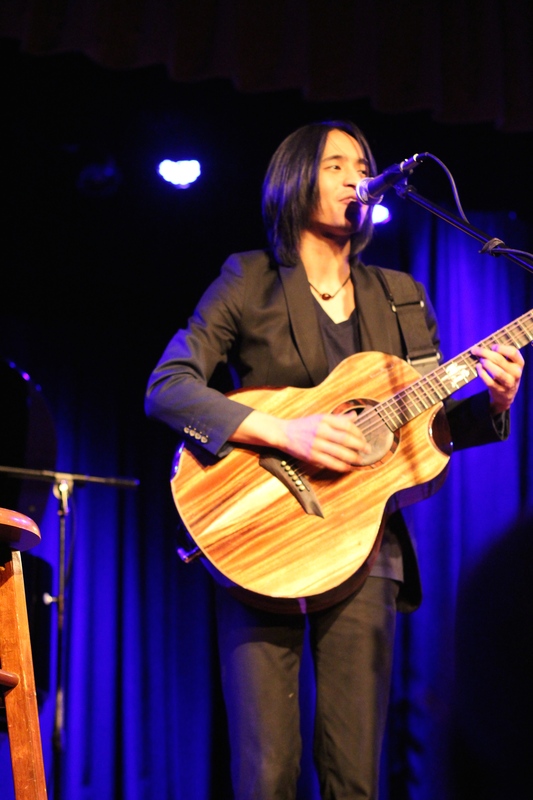 Guitar prodigy Shun Ng took the stage and wowed with very impressive, complex guitar pieces and reinterpreted songs, including “Bohemian Rhapsody.” Ellis is a mentor to this talented 25 year old, and helped him write the lyrics for the first of the songs he played that night. When Ellis’ guitar string broke later in the evening, Shun brought Ellis his own guitar to use. I liked seeing their friendship and admiration for each other, and am happy to see Ellis’ continued support of young musicians. Ellis took the stage and welcomed us warmly. He lived for a couple of years in the midcoast and many of his friends and neighbors from those years were at the show. This was my 44th Ellis Paul show, and I think he sounded the best he has in ages (even though he told us later in the show that he had a bit of a cold). 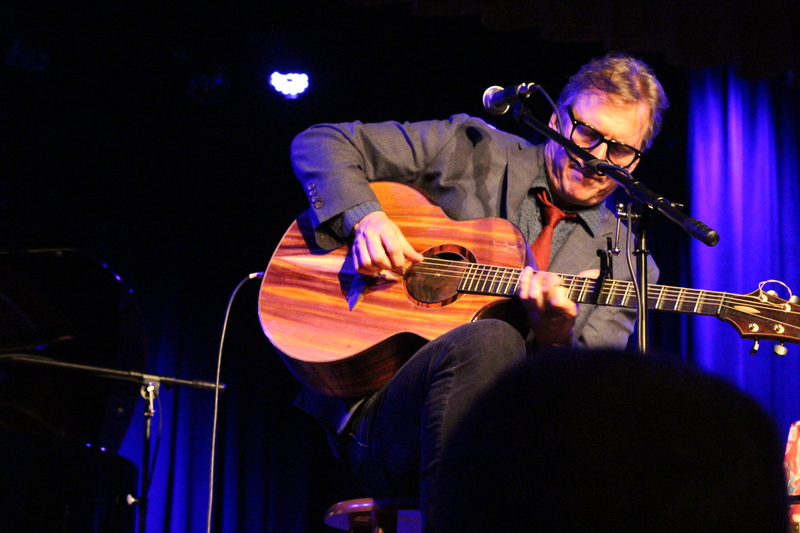 The majority of songs he played over the course of the evening were from his most recent fan-funded album, Chasing Beauty, and his 2010 release, The Day After Everything Changed. Ellis showed us the vinyl version of Chasing Beauty and a copy of his first children’s book The Hero In You. 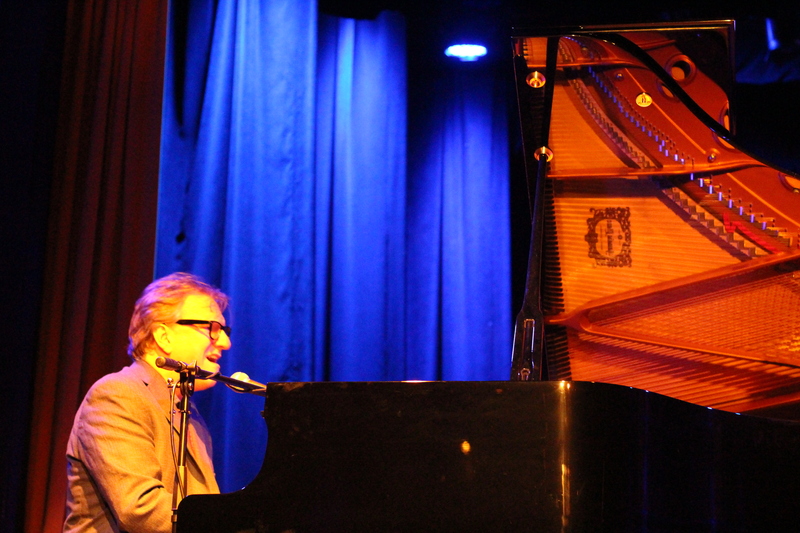 He reminisced with the crowd throughout the night about shows he’s played in the area, including a show years ago at Bowdoin College (I couldn’t help myself and shouted out that the Bowdoin show was my first time seeing him and he joked that “you never forget your first time!”). Laurie MacAllister, who plays bass for Red Molly, joined Ellis for two songs. They honored the late Pete Seeger by playing his “If I Had A Hammer” and closed the night together with a beautiful version of “Let It Be.” I see Ellis live so often that I am very familiar with the content of his live show, but I got a special treat because he played a song I’d never heard before–“I Ain’t No Jesus”—which I loved. I was glad that Ellis played some of my favorites for Dot to experience live—including “Maria’s Beautiful Mess” and “Hurricane Angel.” We got to sing along on “Kick Out the Lights” about Johnny Cash kicking out the lights at the Grand Ole Opry. Ellis hopped off stage and played “Annalee” and “The World Ain’t Slowin’ Down” unplugged from the floor. He asked us to sing along and at some point I realized mine was the only voice besides his I could hear. It was as close to singing a duet with Ellis that I’ve come. Maybe we should do a song together at my 50th Ellis show? It won’t be long. Thanks for a great night!